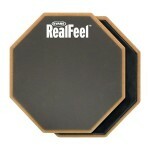 The RealFeel Double-Sided 12-inch Practice Pad has a very quiet natural gum feel on one side and a harder, louder, rubber surface on the reverse side. Excellent for corps-style drumming and workout. This will fit into a standard snare basket. 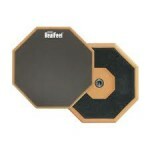 The RealFeel Single-Sided 12-inch Practice Pad features a large playing surface and is ideal for placing in a standard snare basket or on top of the snare drum. It has a natural gum feel and is very quiet with a good stick-rebound. The underside has soft foam so it can rest on a tabletop or snare drum without damaging the surface.